The Portable Pro Pool Lift features a completely portable design, eliminating the need for anchors. The compact frame allows the lift to be transported from or around the pool area with ease. Simply wheel the lift to the poolside, quickly deploy and it’s ready to use. Its stainless steel construction allows the Portable Pro Pool lift a 350-pound weight capacity. As with all Aqua Creek pool lifts, the Portable Pro Pool has a durable powder coat finish. The use of flip-up armrests makes lateral transfers easy. An easy to use, 2 button, water-resistant handset gives the user full independence when using the lift. For additional comfort and security, the lift comes standard with an adjustable footrest and lap belt. 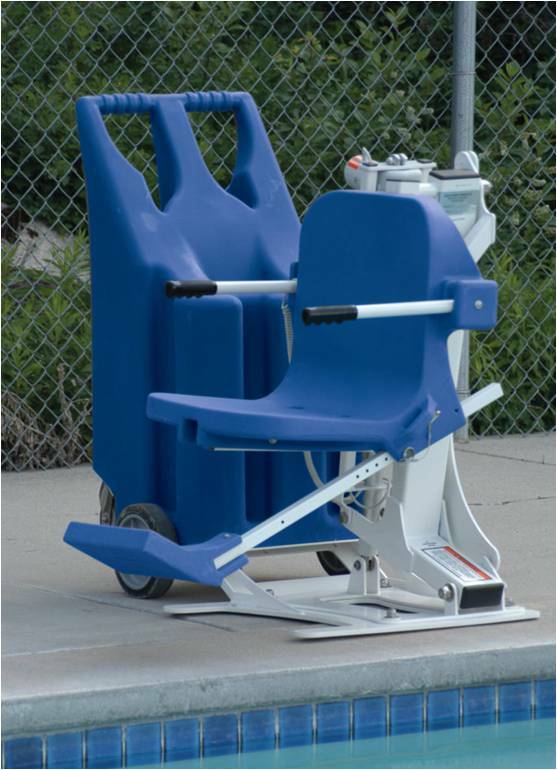 Its exceptional mobility and aesthetics make the Portable Pro Pool one of Aqua Creek’s most popular lifts!